Category: Online Courses. 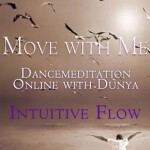 Tags: Dunya Online, Move with Me: Curves & Heart. Join me for a break from your moneky-mind folderol. Breathe all the way to the bottom of your full breath. All the way to your toes. Feel lively in all your in-betweens and melt the crud that’s been gluing you stiff. Emergency medicine: Do that last 12’ of the Move with Me video segment. This intuitive flow has calming, healing powers.